We believe every effective search begins with a well-defined search process. Our search processes deliver results effectively and efficiently. 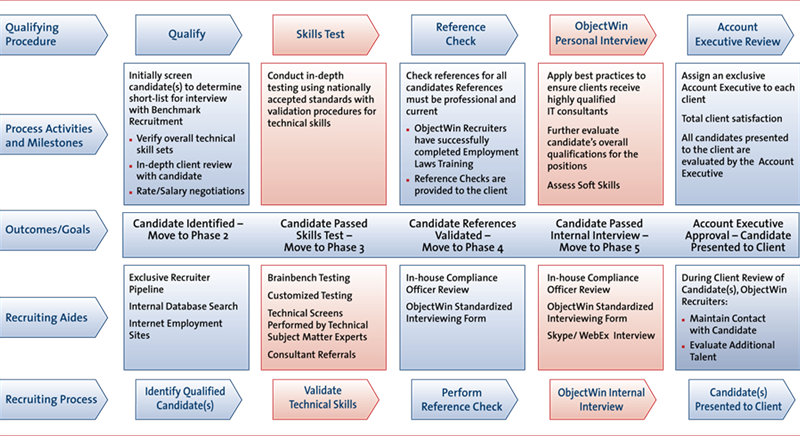 The following outlines our proven talent acquisition process. At Next Tech inc., we focus on delivering effective and optimal results for our clients and candidates. We have one thing in mind; to consistently deliver the top 20% of candidates because top 20% are 80X more productive then other 80% – the kind that make a real impact on your business – who are right for your position and your company. We accomplish this by performing a sequence of steps which are customized based on your company’s unique hiring needs and problems in a professional, personal and expeditious manner. These steps aren’t performed by just any recruiter but by our recruiters, recruiters that are skilled professionals and are experts in your industry. Although the specific sequence of steps performed for your search will be tailored to meet your needs, below is a summary of the types of activities.